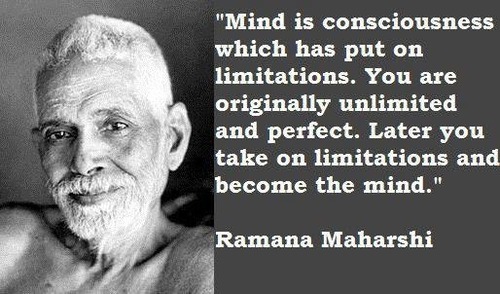 I want to introduce all of you to a famous Yogi sage named Ramana Maharshi. This quote goes directly against the wisdom of our age. We’re so often told that to find happiness in life, we must experience as much as we can of the world, ever shooting for the stars, giving it all we’ve got. The more you can experience, the deeper and richer you’ll be as a person, and the more fulfilled and happy you’ll be. Or so it goes anyway. 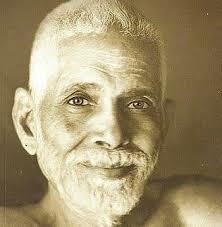 If you believe that, I encourage you to read Maharshi’s books. I think he’ll have you rethinking your entire perspective on life. I hope this post will share some of his wisdom on happiness with all of you. That’s profound. I can’t believe I failed to see this before. When you go out, pursue your dreams, and achieve something, that short burst of temporary happiness has NOTHING to do with the achievement itself. What actually happened is your mind was temporarily satisfied, so it shut-off, and in that mental silence your true nature of happiness and bliss shined through. But this doesn’t last long. The deluded mind ramps back up again, dreaming and scheming, and it’s found a new goal to chase, a new circumstance perceived worthy of experience, and you bite down on that hooked bait like a fish in a pond. Like a fisherman, the mind yanks you right out stillness and you begin suffering again. The Buddah warned us about this. Remember his four noble truths? What was the first? Suffering exists in this world. The second? This suffering is created by craving and desire, or in other words, chasing the impermanent, temporary objects of this world of ever-shifting forms, mistakingly believing that they hold your happiness. And how does one end this suffering? The third noble truth, where one must become mentally silent, free of this kind of desire, free of this seeking and chasing. It’s not that you don’t do things in the world, it’s that your happiness doesn’t depend on the outcome. Let your light shine, as they say. Don’t let the false-mind’s confusion cover over your true nature, your eternal bliss which is yours, and always will be yours. And once we reach this mental silence, what shall we perceive, according to Maharshi? What is our ultimate nature? “What exists in truth is the Self alone. The world, the individual soul and God are appearances in it, like silver in mother-of-pearl; these three appear at the same time and disappear at the same time. Is there any evidence that this is truly what we are? Does this divine essence, this Holy Spirit, really dwell deep within us, masked over by some illusory mind? From my own research, especially in near death experiences, millions of people attest to this divine state when they die and are then brought back to life by doctors in the hospital, or whatever it may be. For example, listen to this man’s account. He speaks of this same bliss-consciousness, uniting with some deeper essence of himself which is best described as peace, love, and joy. He became all-knowing and time dissolved, entering a state where all happened at once. He specifically tells you that all of this beauty and all knowledge, everything, all possibilities, “it became me.” Sounds exactly like what Maharshi and other spiritual sages speak of. When one quiets the mind and rids oneself of delusions, this inner reality begins to seep into you once again, and a peace and joy that isn’t dependent on external circumstances will rise within you. Well, it’s not really rising, it’s always been there. It’s more so you realizing it’s there and perceiving it once again because your mind is now quiet enough to perceive it. I believe them, because the more I silence my own mental world, I can feel this inner peace.